Between February 6-22, Professor Joseph Zompetti of Illinois State University’s School of Communication traveled to Bishkek, Kyrgyzstan, on a Fulbright Specialist Grant. 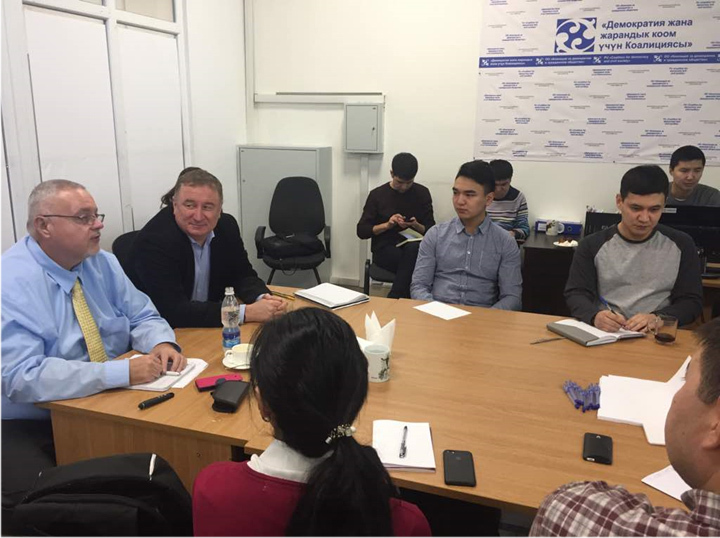 Given Zompetti’s expertise in the areas of political communication, argumentation, and persuasion, various groups in Kyrgyzstan, led by the U.S. Embassy, invited him to conduct a series of workshops, seminars and presentations. While in Bishkek, Zompetti met with three types of groups. The first group consisted of college and high school students along with teachers at various universities in the Bishkek area. The second group was NGOs and civil society organizations interested in advocacy skills and capacity building, including the Institute on Migration and the Coalition for Democracy. The third group was comprised of government-related entities, such as the U.S. Embassy staff, the U.S. Agency for International Development, and the Kyrgyz National Press Corps at the Kyrgyzstan parliament. Throughout his trip, Zompetti relayed to his various audiences the significant work that Illinois State University does in the United States. According to Zompetti, “As I discussed political communication and persuasion with different Kyrgyz groups, I couldn’t help but emphasize the valuable role civic and political engagement plays here at home on our campus.” As a result, many students inquired about applying to Illinois State, and many teachers wanted more information about ISU’s teaching techniques, Zompetti said. Author of the recent book, Divisive Discourse: The Extreme Rhetoric of Contemporary American Politics, Zompetti tried to emphasize the crucial nature of democracy in our current world, along with the vital skills citizens need to maintain it. Concepts such as argumentation, critical thinking, and public speaking are not typically taught in Kyrgyzstan, Zompetti noted. As a result, Zompetti said his visit to Kyrgyzstan hopefully will make a significant contribution to the ongoing learning and advocacy building with core groups in that civil society. For more information, contact Zompetti at (309) 438-7876, or via e-mail: jpzompe@ilstu.edu.